Our basketball database is the most complete source of the world’s basketball data and basketball analysis. For current and historical basketball players, leagues, teams, scores, results, and statistics. We have all the world’s basketball data in one place. It is a vital source of information for basketball scouting and basketball recruiting. Let’s see if our big data and basketball analytics can help you produce big results. We have tons of information on all major international basketball leagues in the world. With historical overviews, standings, schedules, results, stats, players and more. To see our video tutorial, go to our post about international basketball leagues. We also have an international basketball calendar with all the world’s scheduled games. From the past, future, and present. With results, and box scores. Our post global basketball calendar has a video tutorial as well. Another popular feature is our daily list of international basketball transfers where we keep track of which player signs where. To see our video tutorial, go to our global basketball transfers post. Then, there is our player search tool. This is the most unique feature of our basketball database. It lets you search, filter, rank and compare any player in the world. On any criteria! It is the perfect way to scout basketball players and teams. Let our video tutorial walk you through the many features. Just click on our post about the basketball player search tool. Of course, we also have a search tool that allows you to search, filter, rank, and compare teams as well. Check out our video tutorial by going to our post about advanced search tool for basketball teams. If you want more information ton on a specific player then you can find that on his player profile. Personal data, awards, stats, splits, analytics, comparison tool, career overview, career highs, current agent and more. Our basketball player profile post has a video tutorial that shows you all the features. Teams have their own pages as well. With a historical overview, game log, results, stats, analytics, team roster, comparison tool, key facts and more. Go to our post basketball team info to see the video walk-through. Big data and analytics have entered the world of sports and taken it by storm. When Leicester City stunned the world by winning the Premier league football championship in 2016 they did so with the help of data analytics. In the world of basketball, the Golden State Warriors have built their franchise around advanced basketball stats. Therefore, it is clear that numbers have an important story to tell, but they rely on you to give them a voice. Players, teams, basketball scouts, agents, media, and fans will all be impacted by this new trend. Here is how our basketball database can help you scout basketball players and teams and how it can also be a factor in your basketball recruiting. Coaches can use our site for game preparation, analysis, and scouting. While GM’s can use it as a basketball search engine to find available players (free agents) or PER leaders at any given time. They can also compare multiple players head to head. Players finally have a standardized player profile that matches the needs and criteria of the professional basketball world. They can use advanced stats and basketball metrics to enhance their market value and improve their skill level. Players can also find information about agents and teams on our site. There are thousands of professional teams on this planet. Do they all know which players you represent? Our site can help with this. Our advanced stats, splits, and player comparison tool, helps you highlight the strengths of your current clients and boost their market value. Moreover, you can keep track of your player’s performance wherever he plays on this planet. The days are gone when it was enough for the media to simply write a game recap. Readers want to know more. They want data, facts, trivia, background stories and thorough basketball research. Our basketball database offers all that and more. It is the ultimate basketball reference and basketball research tool. Fans can use our advanced search features for endless data mining and finding interesting facts about basketball. They can keep track of their favorite team or player anywhere in the world and explore the hidden numbers behind basketball analytics and advanced stats. “Without big data analytics, we are blind and deaf, wandering out onto the web like deer on a freeway.” – Geoffrey Moore, author, and consultant. Our basketball database is also a basketball search engine and basketball research tool at the same time. Most noteworthy is the fact that we have key facts on leagues and teams and also advanced stats for players as well. Not only for the running season but from past seasons as well. We have special features for basketball analytics. For some time, advanced basketball stats have been used by NBA teams for “smarter” forecasting and better recruiting. The process is complicated and expensive, often out of reach for most fans, players, and clubs. But Court Side Newspaper is changing that. We are providing advanced basketball stats for every player, team, league, and level in the world. This includes the Euroleague and other FIBA competitions, but also NAIA and NCAA. We have written several in-depth articles about basketball metrics. One of the most popular ones was “basketball stats; analytics or video?” We also have articles on the best and worst NCAA Division 3 basketball teams and various All-Season teams based on basketball data analysis and PER leaders. 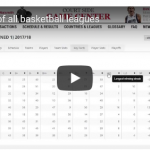 Check out our tutorial videos and take a tour of the most exciting basketball database and basketball reference online. You can also go directly to our Game Center with our Worldwide Coverage & Analysis of Every Basketball League, Team & Player. 2 Responses to "The ultimate basketball database"